Melbourne is known for museums, shopping, parks, zoos & aquariums, and nightlife. Your plan includes some of its best attractions: admire the natural beauty at Royal Botanic Gardens, admire nature's wide array of creatures at Melbourne Zoo, take in panoramic vistas at Eureka Skydeck 88, and enjoy unforgettable views with a balloon tour. To see maps, ratings, other places to visit, and tourist information, refer to the Melbourne online tour planner . Singapore, Singapore to Melbourne is an approximately 10.5-hour flight. You can also do a combination of flight and shuttle. The time zone difference moving from Singapore Time (SGT) to Australian Eastern Standard Time (Victoria) (AEST) is 2 hours. Expect much colder temperatures when traveling from Singapore in May; daily highs in Melbourne reach 20°C and lows reach 9°C. Wrap up your sightseeing on the 14th (Tue) early enough to travel to Sydney. Spend the 18th (Sat) exploring nature at Sydney Harbour National Park. 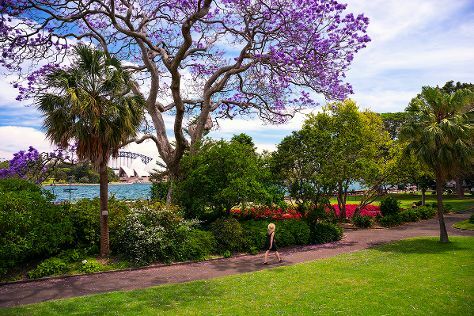 The adventure continues: take in nature's colorful creations at Royal Botanic Garden Sydney, make a trip to Sydney Harbour Bridge, tour the pleasant surroundings at The Opera House to the Botanic Gardens Walk, and enjoy the sand and surf at Bondi Beach. To see more things to do, reviews, other places to visit, and other tourist information, refer to the Sydney travel tool . Traveling by flight from Melbourne to Sydney takes 3.5 hours. Alternatively, you can do a combination of shuttle and flight; or drive. Traveling from Melbourne in May, expect Sydney to be somewhat warmer, temps between 24°C and 14°C. Wrap up your sightseeing on the 20th (Mon) to allow time to travel back home.